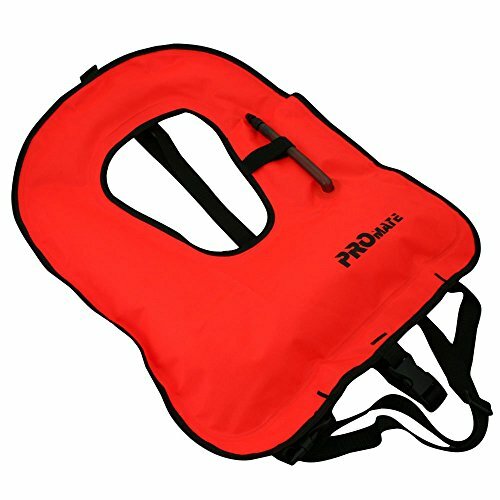 Seal buddy vests are designed to allow you to swim with your head in the water as opposed to standard life vests that are made to keep your head out of water. 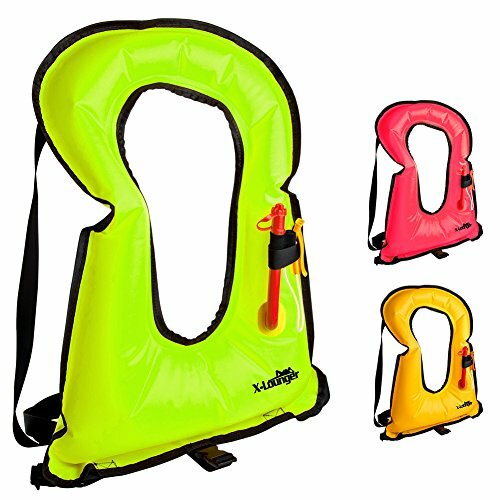 They are inflatable so you can add or subtract air to meet the level of buoyancy needed by the user. 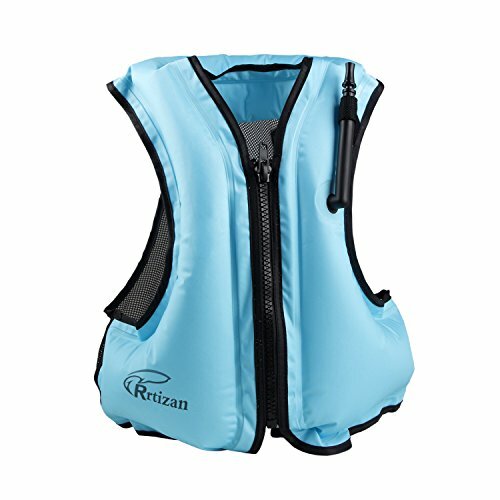 With an adjustable waist and crotch strap, the user is able to secure the vest in place with maximum comfort. 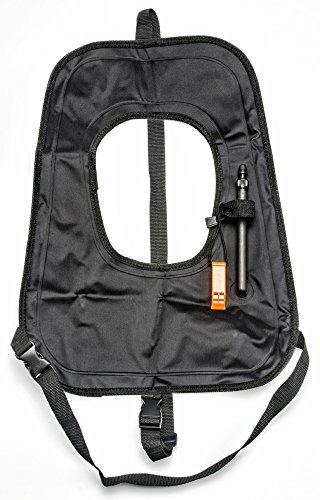 This snorkel vest should be considered a necessary piece of your snorkeling equipment. 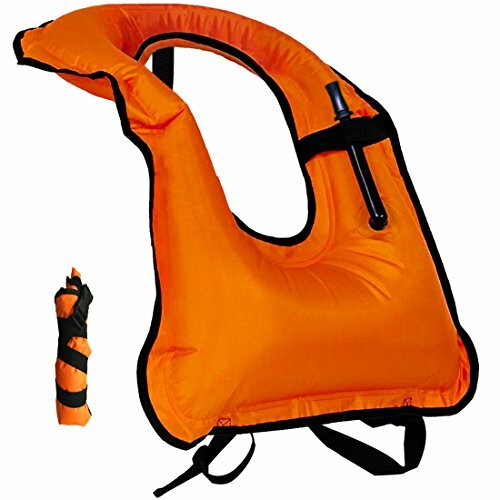 The inflatable life jacket is designed To ensure your safety and prevent accidental events when you doing water activities. Also to elevate your confidence and self-reliance in the water.Designed for Snorkeling: For novice, snorkeling with our snorkel vest can elevate you confidence and ensure your safety. For expert, the snorkel jacket can make snorkeling a breeze when you get tired. Excellent swim helper: With an easy-to-access oral inflation tube, you can easily to increase or decrease buoyancy as needed to help you learning swim easier. 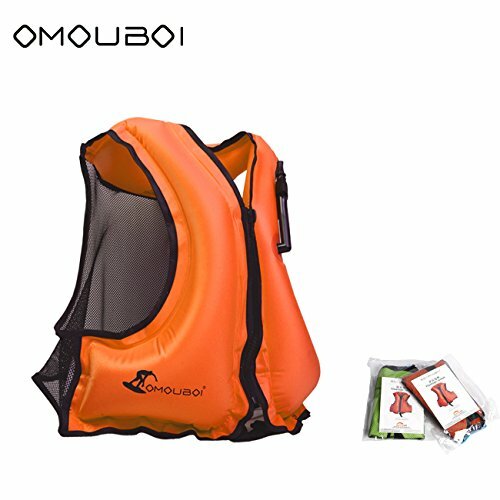 Designed For Snorkeling:In contrast to life vests meant to keep your head above water, our vest enables you to swim smoothly with your head in the water. 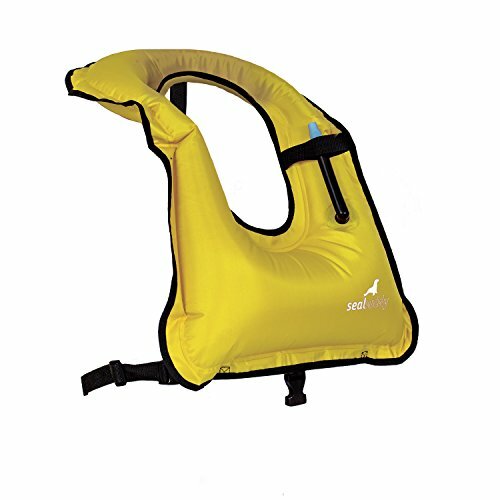 It keeps you buoyant longer for a safe and enjoyable experience - without worry of surprise riptides or fatigueClever Inflation Mouth Piece:With an easy-to-access oral inflation tube you can adjust your level in the water even while you're wearing the vest. Add more air to lift yourself higher above the waterline or deflate to get closer to the beauty beneath the ocean's surface. Fast inflation and fast deflation,just need several seconds !Innovative design:Zipper design make you put on and take off more easily. Waist strap fixed vest with your baby and provides extra security for those wew to snorkeling. The back is a grid , breathable, cool and comfortable,give you more funs during the snorkelingAdjust to Perfect Fit:Keep your vest where you want it with simple adjustable waist straps. so that your jacket doesn't slip or ride up while you scout for coral reefs bright fish or sunken ships. How to wear? 1.Loosen the straps to make them bigger; 2.Put your head through the hole and the crotch strap falls behind you; 3.Find the waist strap and bring it around you, secure the male buckle to the corresponding female buckle,the same as the crotch strap; 4.Adjust the straps length to your most comfort; 5.Press down the air valve to inflate or deflate the air and when loosening your fingers, the valve will automatically lock the air in. 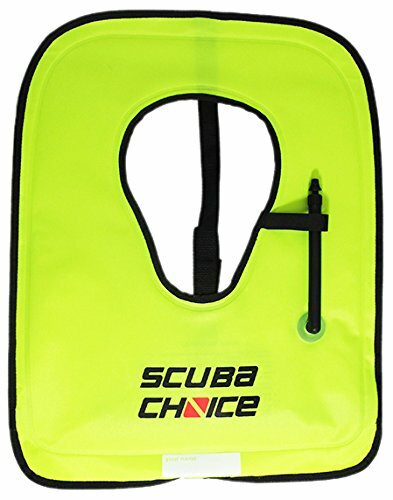 What kind of water activities i can take with this snorkel vest? Group snorkeling, family skiing, swimming, surfing, yachting, rowing, canoeing, water polo, wind surfing, motor boats, water wheels, rubber boat,water trampoline and any water activities. What is the purpose? To ensure the water safety and prevent accidental events. 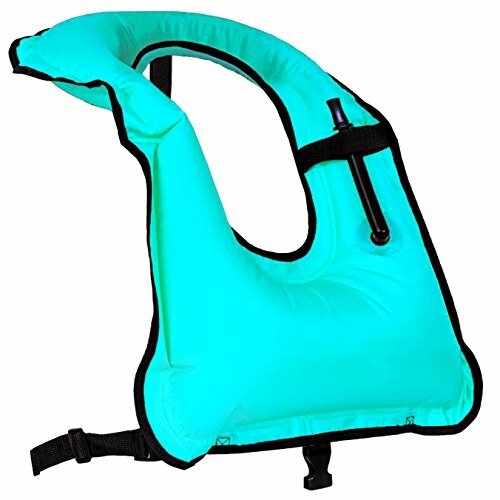 To elevate your confidence and self-reliance in the water. Shell is made of tough 420 denier Nylon/PU bond to the inside. Design all front mount (horse collar). Approximately 15 lbs buoyancy. High-visibility neon yellow air cell. Quick-release buckles on back and crotch strap. An oral mouthpiece with safety ring on 6" inflator valve for easy operation. Compact for easy storage during travel. The highest quality snorkel vests in the world are made by Innovative. Innovative Scuba has been designing and manufacturing scuba diving and ocean equipment for more than 25 years. We combine our experience with cutting edge materials and designs to create highly functional, premium quality equipment that is built to last. All of our products come with a full Manufacturer's Warranty. 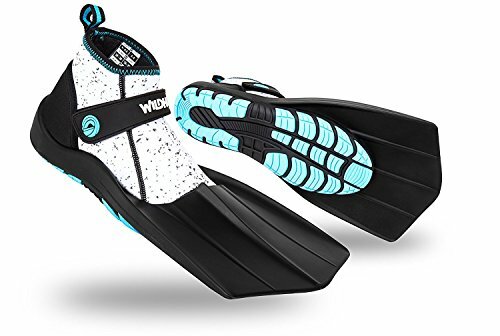 Wildhorn Topside Snorkel Fins- Compact Travel, Swim, and Snorkeling Flippers for Men and Women. Revolutionary Comfort on Land and Sea. Wildhorn Topside Snorkel Fins- Compact Travel, Swim, and Snorkeling Fins for Men and Women. Revolutionary Fit for Land and Sea.